Amanda Mark and Crystal Bruning with the League City Intermediate PTA present Madeline Boehning with her grant for “Personalization and Pop Culture Improve Writing”. Also pictured is her excited principal from League City Intermediate Kim Brouillard. 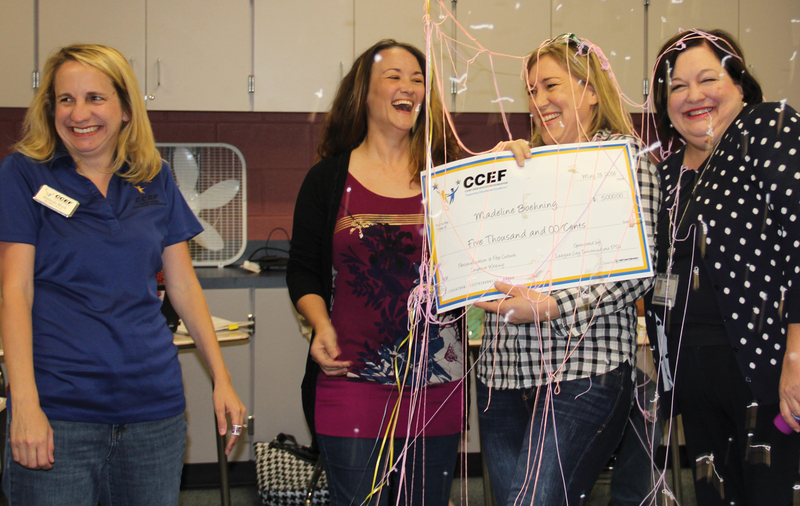 The Clear Creek Education Foundation visited 34 outstanding CCISD teachers on 20 campuses during its annual Sur-Prize Patrol – leaving the teachers wide eyed and wearing big smiles as CCEF board members and community partners passed out Teacher Innovative Grants totaling more than $97,000. In a surprise move, another $11,000 was awarded students. The Clear Creek Education Foundation awards teachers with grant money each year through its Teacher Innovative Grant Program, giving them the opportunity to take education to the next level and providing unique, hands-on learning experiences in the classroom. Since the Foundation’s inception in 1992, more than $2 million in Teacher Innovative Grants have been disbursed district-wide. Vy Tran of Clear Horizons Early College High School can hardly contain her excitement on winning her grant, “Community Health and Education Fair.” Helping her celebrate are sponsors Rebecca Lilley with Memorial Hermann Southeast, CHECHS principal Dr. Brett Lemley, Danny Brewster with IBI Architects and teacher sponsor Valerie Kahlich. From take-home makerspaces that will impact three campuses, a courtroom on wheels, Google Cardboard kits, writing while learning character building programs — and so many more — this year’s Teacher Innovative Grants were more innovative than ever and will impact over 20,000 students either directly or indirectly. CCEF was excited to open the opportunity for high school students to apply this year through the Student – Teacher Innovative Grant program and will be funding over $11,000 to four high school students for the 2016 – 2017 school year. 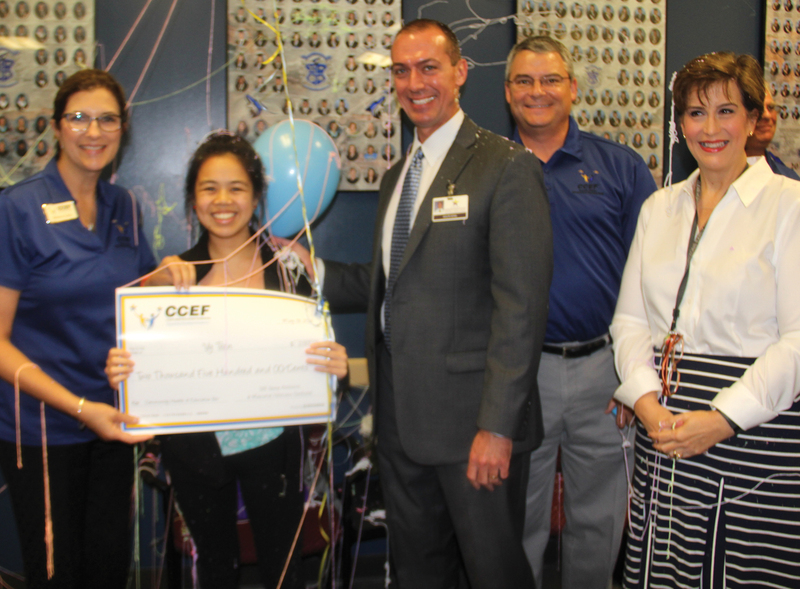 Funding from the Clear Creek Education Foundation is made possible thanks to the many Friends of the Foundation, individuals and businesses, who have partnered together to Support Educational Excellence in CCISD through the Teacher Innovative Grant Program. The Foundation feels the Teacher Innovative Grant Program is a vital and necessary strategy in assisting teachers in maintaining the high level of achievement in CCISD. Sponsors who helped made the grants possible include Perdue Brandon, Fielder, Collins and Mott, Joiner Architects, Bauerschlag PTA, Balfour, Lockheed Martin, Lewis Jewelers, DeBusk Services, CCEF Tennis Tourney, Ron Carter Cadillac Hyundai employees, Marathon Petroleum, Steve Jackson, Mimi and Mike Huss, Gary and Dr. Sandra Mossman, Icon Bank, HEB, HydroChem, Gulf Coast Pipeline Services, CCISD cabinet and trustees, HomeTown Bank, McRee Ford, South Shore Grille, BP Texas City, PBK Architects, Chemical Process, Primrose-Clear Lake, VLK Architects, Gulf Coast Educators Credit Union, League City Intermediate PTA, Bartlett Cocke Contractors, Durotech, Norman Frede Chevrolet, Maxim Group, Raymond James Financial Services, LyondellBasell, BB&T, Memorial Herman Southeast and IBI Architects.